The pigs are happy, we've moved them out of the stable, into a pen, under some pine trees. They have been rooting around, discovering lost items from previous owners, like a clevis pin and an powerline insulator. We have 3, 2 males and a female. They lay around a lot. On warm nights they sleep outside of their hut, side by each, with legs resting on each other. We can see them from the window over the kitchen sink. These are blueberry blossoms. Beautiful in a delicate and subtle sort of way. In an attempt to avoid the poor harvest conditions we had in '06, we made arrangements this winter with an organic beekeeper to place some hives at our place during the blossom season (late May thru mid June, after the cherries and apples). The plans fell thru when her bees didn't make thru the winter and her replacements arrived in similar shape. Since there was no backup plan, we had to rely on the natural bee population. John went out and provided lots of encouragement to the bumblebees and butterflies (mostly swallowtails). Our fingers are crossed. Adam Figures has been making bimonthly visits to the farm to lend a hand. Although he prefers to work with his hands, I was able to convince him to climb on the tractor for this picture. Notice his Deere green colored cup AND the plowed field in the background. Those who visit us to pick berries in August should notice some agricultural changes to the farm. In the hopes that this is a good omen, our cherry trees seem loaded with the early indications of fruit. Last year the trees were covered with blossoms but only a couple (blossoms, not trees) became cherries. This year Genny decided to take matters in hand and used a feather duster to pollinate some of the trees. Didn't seem to matter as all the trees are loaded. Those select few of you who follow this post may notice that there seems to be more pictures of Gen than Mike. There are several reasons for this. 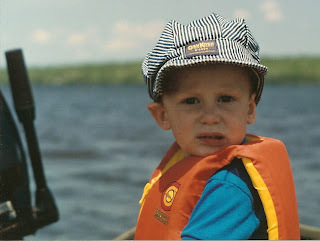 Mike was our 2nd (and last) child, so we possess far fewer pictures of him. He has always been "faster" and less "manageable" so he was more difficult to acquire with a still camera. Gen is quite the picture taker, so a lot of the pictures on this post with her in them were actually taken by her. 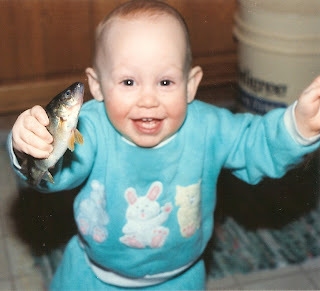 Anyways, in an attempt to even up the score a bit, here are some photos of Mike to balance with Gen.
Mike has always liked fish (at least to hold) and fishing. This is a perch from ice fishing when he was around a year old. Mike has always had a knack for steering a tiller-driven boat. He certainly has the sea-captain grimace down pat, eh. 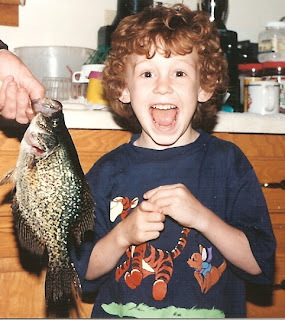 Here he is with a crappie he caught when he was 4. Dad got skunked, which Mike proudly announced to the game wardens that met us at the dock upon our return from fishing. Although now it is MUCH harder to get his rear out of the sack to go hunting, at one time I could not get away with leaving him behind. 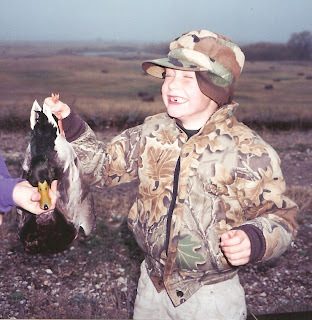 This is a picture of him at 5 yrs with a mallard that we got in North Dakota. On this particular day the rain was mixed with sleet and its trajectory to the ground was about 45 degrees. He didn't mind. What Mike can lack in common sense, at times, he more than makes up for in enthusiasm. 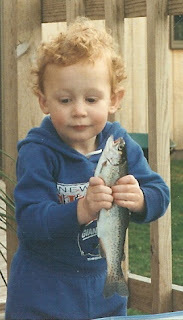 Here he "netted" a bluegill that his little cousin hooked from our dock at our camp. 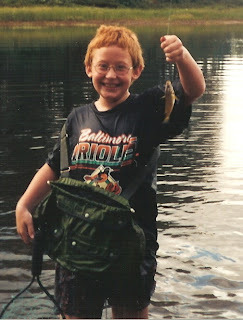 His cousin could bring it in no further, so Mike saw the only remaining option was to dive in and "retrieve" the fish. You can see the pleasure at his decision written all over his face. He now shows more restraint.